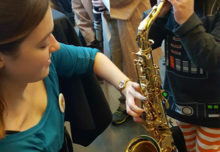 NEW YORK CITY (JTA) – From the wizardry of Harry Potter that echoes with Passover’s themes to a cartoon frog who wisecracks his way through the seder, this year’s new crop of Passover books for kids offers something for all ages and interests. The selection of fresh reads, including two family-friendly Haggadahs, also includes an unusual Jewish immigrant tale set in rural Argentina and a heartwarming, intergenerational story about an aging grandfather and his devoted granddaughter. Choose one — or several — to educate and engage the young readers in your family. Fans of Harry Potter will be in Hogwarts heaven this Passover. 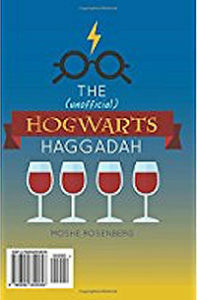 Moshe Rosenberg’s Haggadah draws on the parallels between the wizardry of the best-selling Harry Potter books and the seder guide. “From the concepts of slavery and freedom, to the focus on education, to the number four, Harry Potter and Passover share almost everything,” Rosenberg writes in the introduction. This is the second Jewish Harry Potter-themed book by Rosenberg, a rabbi and Judaic studies educator in New York. (The first was Morality for Muggles: Ethics in the Bible and the World of Harry Potter.) Traditionalists, take note: Rosenberg assures readers that every word of traditional Haggadah text, in Hebrew and in English translation, is included. Interspersed throughout is commentary, via the lens of J.K. Rowling’s characters, that takes on questions of freedom, evil and the Four Children. There’s even a Harry Potter-themed version of the popular seder song “Had Gadya,” (“One Small Goat”). A wisecracking frog takes center stage in this kid-friendly Haggadah that is a complete guide to an, abbreviated seder that’s designed to be 30 minutes to an hour. Filled with photographs and illustrations, it begins with a seder checklist and candle-lighting prayers, and guides families through the mainstays of the seder, from the Passover story, to the Ten Plagues to welcoming Elijah the Prophet. Songs go from the traditional favorite “Dayenu” to “Take Me Out to the Seder.” A cartoon frog appears throughout with jokes and funny comments (“Hold on! I brought my hopmonica!”) that may bring giggles and keep kids engaged. Every year at the seder, Rachel’s Uncle Harry hides the afikomen. 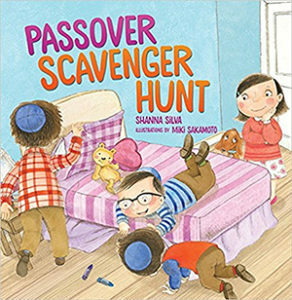 The kids hunt for the matzah and get a prize for finding it. But there’s one problem: Uncle Harry always makes it too easy! In Shanna Silva’s story, Rachel takes over the job. She grabs her markers, scissors and a big piece of cardboard and creates a scavenger hunt with six rhyming clues to stump her cousins. Each clue reveals something related to the seder, from the charoset to the shank bone. In the end, the kids are left with a puzzle to solve that will lead them to Rachel’s perfect afikomen hiding place. Miki Sakamoto’s illustrations are bright and colorful and capture the fun as kids move picture frames, race around the house and crawl around closets looking for clues. On the way to her grandparents’ house for the seder, a young girl named Jessica is busy practicing The Four Questions, in Hebrew. Jessica loves spending Passover with her grandparents, where everything is the same year after year – running up the stairs at their apartment, finding piles of blankets and pillows for the sleepover with her cousins, and enjoying the good smells emanating from the kitchen. But this year will be different because her grandfather just got home from the hospital and is too weak to come to the seder table. In this heartwarming intergenerational story, Jessica comes up with a plan for how Grandpa can still lead the seder. Jeremy Tugeau’s large, expressive illustrations capture Jessica’s emotions of joy, disappointment and the love she shares her with grandfather. From Jewish children’s book writer Barbara Diamond Goldin (The Best Hanukkah Ever, Journeys With Elijah) comes an unlikely Passover story set in the Argentine countryside in the late 1800s. Jacob is a young Jewish boy whose Russian family immigrated to Argentina, but he doesn’t quite fit in. He makes a new friend, Benito, who helps him learn to ride horseback. 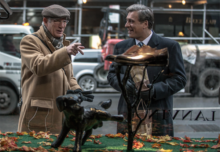 Jacob works up the courage to invite his non-Jewish pal to his family’s seder, but Benito says he has farm chores to do. 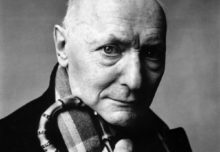 When Benito ends up coming, at just the right moment: when Jacob opens the door to welcome Elijah, just as a flock of chickens arrive, too. Benito helps round up the chickens and joins the seder. As the family welcomes its new friend, they learn from each other about the meaning of freedom — and Jacob’s mother and Benito also surprise him with a lasso and clothing he needs for an upcoming rodeo. Artist Gina Capaldi puts readers right in the action; kids will feel as if they are riding along on horseback with Jacob and Benito, and they’ll feel part of the family’s seder. An author’s note explains that in the 1880s, Jewish immigrants from Eastern Europe arrived in Argentina. Goldin also poses a timely discussion question that asks families to imagine what it would be like to move to a new country. Kids get an up-close look at how matzah is made in this book overflowing with stunning color photographs that bring to life small-batch, handmade matzah-making to factories that bake 35,000 pieces of matzah every day. Kids see the spiked rolling tool used to make the tiny holes in the matzah and get a peek inside the hot ovens required for baking. Captions and explanatory text are informative but simple, making the photographs the stars of a book that will appeal both to kids and grownups. 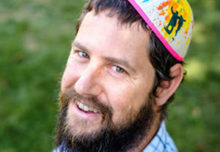 There are several Do It Yourself recipes and craft projects, including baking matzah, making a matzah cover and growing the greens for karpas, the symbolic vegetable eaten during the seder. The ever-popular Sammy Spider — now in his 24th year — is back! 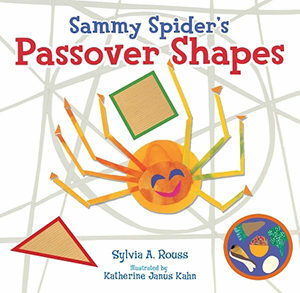 Passover Shapes is the second Sammy Spider board book that is geared for toddlers. In this brightly illustrated tale, the young spider celebrates the holiday with his human friend, Josh Shapiro. Little ones will learn about Passover as well as basic shapes.